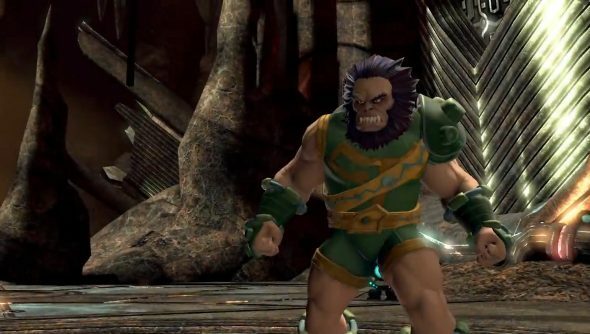 The Jack Kirby-created New Gods have come to DC Universe Online. The residents of Apokolips and New Genesis are looking for a pick me up in the form of power from the relics of ancient deities. And they’ll be fighting each other – along with their hero and villain allies – to get that power, as they are wont to do. Halls of Power Part I launched today, and you can take a gander at some of the scraps you could get into below. While DCUO is free, the DLC is not. It can be purchased from the in-game store or from Steam for £6.99/$9.99. Subscribers get all DLC for free, however. And DCUO is one of those games where I don’t really mind the subscription fee, because it’s part of the SOE All Access membership. It’s cheaper than most MMO subscriptions, but you get access to PlanetSide 2, Everquest 2 and DCUO. New titles like Landmark will also be added eventually. I dip in and out of DCUO, since I never quite have my fill of superhero antics. I confess that the main draw is flying around Gotham and Metropolis hunting for collectibles and the like so I can make my characters look like they’ve leaped out of the pages of a comic. I’ve also started to get a wee bit hooked on the lair stuff, where you can unlock and design your own secret base. There’s a lot to do – though much of the post-level 30 stuff is grindy – and Halls of Power adds quite a bit more. New raids, operations and alerts are there to be delved into, while new gear, styles and feats will be unlocked amid battles with the New Gods and their minions. Time to look for more costume pieces.